This wooden stairs is leading to Hanyang University Seoul campus. The students who stay in the student hostel have to use this stairs to the campus. 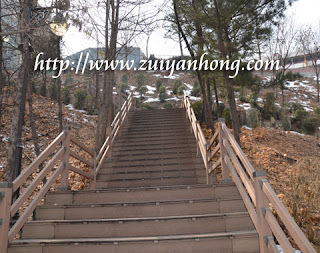 My son stepped on this stairs for two years when he was pursuing his study in Hanyang University. No wonder he walks so fast when he returns to Malaysia. When the graduation ceremony had ended, we followed our son to the student hostel to leave something there. My wife and my son walked in front of me. I was behind them, busy taking photos and enjoy watching the winter scenery of South Korea. It was quite difficult for me to get down from this high and steep stairs because I seldom exercised after retirement. If you still can walk around, why not go for holidays? Remember not to work until your last breath.